Indians howsoever modern they grow their roots are still Indian and still Hindi movies with western sensibilities never work in India case in point Aisha. With Break Ke Baad Kunal Kohli gets into full time production handling the directorial baton to Danish Aslam who debuts with this movie starring Imran Khan and Deepika Padukone. Danish has tried to target the urban audience with this romantic comedy that talks about giving space in a relationship. The story is of Abhay [Imran Khan] and Aaliya [Deepika Padukone] who have known each other since their childhood and soon their friendship turns into love at the tender age of 15, when Abhay realizes that Aaliya is the girl for him. Aaliya’s life is defined by her burning desire to become an actress and she is unmindful of what or who comes in her way. Abhay, who is still unsure about what he wants to do, finds himself competing with Aaliya’s incessant plans and projects to fulfill her dreams. Things come to a head when Aaliya decides to go to Australia to study and Abhay has to deal with the prospect of a long-distance relationship, secretly fearing that he will lose Aaliya forever. They decide to give their relationship a break, so that Aaliya can pursue her dreams. As time passes by, Abhay realises his skills, while Aaliya realises that there is no joy in achieving one’s dreams if one has no one to share it with. On the outer premise the story looks interesting however the screenplay by Renuka and Danish falls flat. Moreover Deepika’s character seems to be a confused person and keeps on breaking the relationship then makes up and then breaks up and finally gets married to Imran’s character. The songs are average apart from ‘Adhoore’, ‘Meri Padosan’ and ‘Dooriyan’. Danish handles few scenes well while Imran and Deepika have acted well. Sharmila Tagore and Shahana Goswami are totally wasted and Lillette Dubey does a good job. 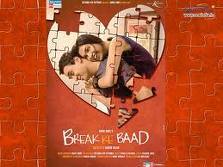 On the whole Break Ke Baad disappoints majorly. I am sure audience will never return after the interval or ‘Break Ke Baad’ to the theatres. A teenager starts breaking his dressing table mirror then he rushes into his bathroom and breaks everything that comes in his way. A girl getting beaten up by her boyfriend and someone hurling the choicest of abuses on another person and trying to physically assault the other person. These are few common things we would have noticed in the last few weeks on television in the name of Reality Television. Reality shows in India has grown by leaps and bounds. After the deluge of Saas-bahu serials every other channel started showcasing reality shows after KBC, Indian Idol, Saregamapa on Zee TV and MTV Roadies caught on. However the reality shows are mocking the real essence of reality television. You can see that every show is clearly scripted and the characters are just acting it out whether it is Dolly Bindra fighting with her fellow contestants in the Bigg Boss House or boyfriends cheating on their girlfriends or vice versa on Emotional Atyachar. You can clearly see the participants are acting out in front of the camera. In today’s world where TRP plays a huge role, every television channel is going out of its way by introducing such cheap tactics in the name of Reality shows in order to garner more advertisers for the shows and for them. So you can see mock fights between judges and contestants of the talent shows, contestants hurling choicest of bad words at their fellow contestants, insulting eachother and opening showing sleaze courtesy Emotional Atyachar. In today’s age where violence is a common factor in our everyday life these channels are encouraging youngsters to resort to it so that they can get their few seconds of stardom. These shows not only are bad content wise but also make a very bad impression on the young minds who think that to become famous the best way is to resort to violence, disregard relationships and become a reality TV star. Television has a responsibility towards the society and with such irresponsible behaviour they are setting wrong examples to our today’s youth. The I & B Ministries resolve on telecasting such shows between 11:00 pm – 5:00a.m. is a welcome change however is this the only way we can discourage such shows? Maybe sensible viewers like us need to take a call. Sanjay Leela Bhansali is a name that is associated with quality cinema and his stories always strike a chord with its viewers except Saawariya which didn’t make any sense nor did it justify to the tremendous potential of SLB. The latest offering from SLB’s creative studio is ‘Guzaarish’ a soul stirring story about a Paraplegia stricken patient. Paraplegia is a complete paralysis of the lower half of the body, including both legs, usually caused by damage/injury to the spinal cord. You can draw many parallels from films like Whose Life is it Anyways or even The Sea Inside but SLB gives a master touch of his own and churns out a beautiful tale that celebrates life. I also would like to inform you that it is no where inspired or copied from Christopher Nolan’s The Prestige as reported by many newspapers in the past. The story is set in Goa and it tells the story of Ethan Mascarehas (Hrithik) who is an accomplished magician and during one of his stage performances he becomes a victim of his own magic and suffers serious injuries turning him into a Paraplegic patient. His world is surrounded by few people, Sophia – his nurse (Aishwarya), Devyani – his lawyer (Shernaz Patel) and Dr. Nitin Naik his physician (Suhel Seth). Ethan who is confined to a wheel chair, becomes a Radio Jockey at an FM Station called Radio Zindagi. His show talks of hope, laughter and sunshine and it’s difficult to imagine that the man behind it has been immobilized with a spinal injury for the last fourteen years of his life. Ethan files a petition in court for mercy killing. This decision of Ethan leaves Sofia stunned as she shares a silent love with Ethan. Ethan takes the help of friend-lawyer Devyani [Shernaz Patel] to support his appeal. Even Ethan’s mother Isabel [Nafisa Ali] supports him in his petition, although Ethan is persuaded by his physician Dr. Nayak [Suhel Seth] to retract his case. Alongside all this, Omar [Aditya Roy Kapur] enters Ethan’s life with the aim of learning magic from him. Impressed by Omar’s love for magic, Ethan agrees to pass on his legacy to him. Performances are the highlight of this movie. Hrithik fits into the character of Ethan easily and you cannot imagine anyone other than him performing that role. Aishwarya is topnotch after a long time. Shernaz Patel, Aditya Roy Kapur, Nafisa Ali and Suhel Seth are very good. Newcomer Monikangana Dutta has very little to do in the movie. On a lighter note SLB even makes the fly act well in the movie. Music by SLB is not a chart-busting fare, however the lyrics and the soulful songs transport you to a different world especially the title song and Tera Zikr. The costumers are good, the back ground score by Tubby and Parik are subtle and very effective as it goes with the mood of the movie, the cinematography by Sudeep Chaterjee is wonderful and the dialogues by Vibhu Puri and Bhavani Iyer is heart touching. The hindarances to the wonderful movie is its pace and heavy dosage of English dialogues that will limit the movie’s performance in the single screens and will only cater to the class audiences. Overall the movie is an emotional fare and might not do huge business at the box office but will reap all the major awards. This week I happened to pick up ‘Tees Maar Khan’ music CD as I always had at the back of the mind that the movie is made by Farah Khan and yes Farah has a great track record when it comes to her movies and her movie music. Who can forget those beautiful songs from ‘Main Hoon Naa’ and ‘Om Shanti Om’? Gems like ‘Tumse Milke Dil Ka Haal Kya Kahe’, ‘Main Hoon Naa-title song’, ‘Tumhe Jo Maine Dekha’, Chale Jaise Hawayein’ from Main Hoon Naa or songs like ‘Dard-E-Disco’, ‘Ajab Si’, ‘Agar Main Kahoon’, ‘Chanse Jo Toote Koi Sapna’ or ‘Deewangi Deewangi’. All these songs had ‘Blockbuster’ written all over it however expecting the same from ‘Tees Maar Khan’ soundtrack is futile. The songs came as a total disappointment for me and I am sure most of her fans would also feel the same. Vishal-Shekhar takes the music from here on with the best song of the album ‘Sheila Ki Jawani’ picturized on Katrina Kaif and sung by Sunidhi Chauhan and Vishal. This is the same song for which Katrina had to work on her abs and figure to look like an item girl. The song is a foot tapper and might find its target audiences in discos. The much hyped song which features Salman Khan in a guest appearance alongwith Akshay and Katrina is the next to be heard titled ‘Wallah Re Wallah’. This song is a typical qawwalli however it doesnt match upto the level of ‘Tumse Milke’ from Main Hoon Naa. There are multiple singers like Shekhar Ravjiani, Kamal Khan, Raja Hasan and Shreya Ghoshal coming together to make ‘Wallah Re Wallah‘ an energetic song but it falls flat on the face. Next to come is a song title ‘Badey Dilwala’ sung by Sukhwinder and Shreya which sounds like a village based song and is not a good track to put on repeat mode. There are heavy doses of Hindi and English lyrics to make it sound better but its an average fare. The last song is another disappointment titled ‘Happy Ending’ sung by Prajakta Shukre, Harshit Saxena, Abhijeet Sawant and Debojit Saha – some of the major constestants from various talent hunt shows on TV. It has been a tradition with Farah Khan movies to have a song when the end credits are rolled out and this one seems to be that song. The song is another average fare again. There is a saying in Hindi which goes ‘Khoda Pahad Nikla Chooha’ that’s what I felt after listening to ‘Tees Maar Khan’ not one song apart from Sheila Ki Jawani stays in your mind. Vishal-Shekhar who gave us soulful music in movies like ‘Anjaana Anjaani’ and ‘I Hate Luv Storys’ this year does a shoddy job. Hope the movie doesn’t let us down the way its music has. The only thing I can tell Farah, Shekhar and Vishal is ‘BETTER LUCK NEXT TIME GUYZ’. It is said ‘Books are your best friend’ and I do second that quote because for me books has always been a friend whom I could depend on anytime anywhere. Some people have their 2 am friends and 4 a.m. friend for me it has been one or the other book who has given me company during such times. I always have a book ready for every situation or every mood of mine. I was not an avid reader but the day I got introduced to the magic of friendship with books I promised myself to stick to them forever. It all started at a very early age in my case, maybe when I was in fifth standard by my brother. The first book I laid my hands was on Enid Blyton’s ‘Famous Five’ series. Then I explored other teen detective series like ‘The Secret Seven’, ‘The Hardy Boys’ and ‘Nancy Drew’. I still remember how along with my friends from our society I started snooping around houses and lonely buildings to catch hold of some mystery or case and become detectives like the Famous Five kids. When I think about those days I still sit and laugh. I still remember we got a bottle of white pills lying outside the window of a lonely house and I wore gloves to pick up that bottle suspecting it to be drugs and assuming that this place might be used by drug peddlers or drug addicts to conduct their criminal activities. I along with my friends used to take turns to keep a watch on that house only to be bitten by a stray dog. When I grew older I preferred more fun based books like Ruskin Bond series, Tom Sawyer and Huck Finn Adventures, Malgudi Days and Swami. The easy flow of words always caught my attention and always transported me to a different world where I could actually visualize these characters and situations. My growing up days was full of Fairies, Ogres, Goblins, Detectives, and Mysteries etc. I often wondered if I could write something similar to those stories which I loved reading. Maybe the germ of becoming a writer took roots in those growing up days and I can say that with confidence after seeing those innumerous diaries that I wrote during those days. Then came a phase in my life when I preferred only English Classics like Charles Dickens, Thomas Hardy, Jane Austin series, Shakespeare etc and I always wondered how the era would be when these books were written. I explored more about the era from history books and encyclopaedia. As I started going to college more mature stuff started attracting my eyes and I started stocking more and more books which were ultimately sold off by my mother one day to a ‘raddiwala’ because she never knew the importance of those books in my life. Today I do have a small library of my own which has been plundered several times by my so called friends who always fail to return the books they borrow from me. I don’t blame them because books definitely have a magic of its own which prompts you to do so. Every stage of my life was influenced by some book or the other. Like when I read ‘The Pastor’s Wife’ I was drawn towards the protagonist’s trauma and pain in a socialist country like Russia. I could imagine the pain felt by the Pastor and his wife who were kept captive in Jail for smuggling a ‘Bible’ to Russia. I could feel the torture they went through for sticking to Jesus and for worshiping the Almighty. Apart from ‘The Pastor’s Wife’ the book that really shook me out was Khalid Hosseni’s ‘The Kite Runner’ a very emotional personal saga of the author. His growing up days in Afghanistan and how he betrayed his best friend who for him got brutally raped and abused by other bully’s in their locality. The story still brings goose bumps to me whenever I read it. Same was the case with ‘A Thousand Splendid Suns’ by the same author. The emotional drama of two women connected by one man married to them and their struggle to keep eachother happy under difficult situations was something that really touched my heart. Books like these are rare and so they are special. Every book has a story to tell and every reader has a story to remember, like me. Hope the saga continues till I lie down to rest forever. After the busy Diwali holidays I was looking forward to watch Ramaa: The Saviour as I was very impressed by the publicity material especially the 3D posters of the movie, something that was never attempted in India before. Another reason for me to look forward to Ramaa: The Saviour was because it is a movie made for children and it has been noticed more often that there are not many films made for children, unlike the West. In the West this genre has been explored many a times and apart from the kids it is also equally enjoyed and favoured by teens and adults. Ramaa: The Saviour enters a zone where no Hindi film has visited in the past i.e. Video gaming. However every concept that looks good on papers might not always look good on screen. Few of the recent releases prove this point eg: Action Replay. Ramaa: The Saviour tells the story of six kids – Rohan, Riddhi, Kunal, Komal, Sameer and Saanjh. The kids play a newly launched video game – The Last Battle – and while playing the game, they suddenly find themselves on an isolated island. The children, while exploring the island, run into trouble. Riddhi is attacked by a giant, Vali [Khali], but is rescued by Ramaa [Sahil Khan], who lives in this jungle all alone. Danger arrives in the form of a boat commanded by Kali with a small army of mercenaries and a scientist-assistant Samara [Tanushree Dutta]. The rest of the tale depicts the fight between the good and the evil. The best thing about Ramaa: The Saviour is that the casting is perfect. Every character suits his / her role and the surprise element is Tanushree Dutta doing action sequences like a pro. Sahil Khan’s role is similar to Tarzan or George of the Jungle and he looks apt for the role with his kind of physique and body language. All the six children are fantastic and so are the villians. However the screenplay needed a lot of polishing and explanations eg: I was not able to understand Vali’s connection with Ramaa and the reason for them to fight with eachother. Moreover it is not explained properly if Vali is a demon or human or a ghost. Also Tanushree is shown as one of the members of the evil clan however she surprisingly joins hands with Ramaa without much justifications. Debutant Director Haadi Abrar should be applauded for opting for an innovative plot, however the writing lets him down. The action scenes by Peter Hein superb especially the fight scene on the river which is purely fantastic. Sejal Shah’s cinematography captures the forests with expertise. Music is a huge let down by debutant music directors Siddharth-Suhas. On the whole, Ramaa: The Saviour is not a promising effort although the concept was good and unique. The recent news to do the rounds is of Adnan Sami turning hero with Bela Sehgal’s new movie. This is not the first time that a singer or a music director or a cricketer has turned towards acting. However, a deep study of the career swaps done by celebrities from different fields to acting has always proved to be a huge ‘flop’ or blunder for the concerned person. It all started with wrestler Dara Singh who turned hero with ‘Ud Chala Jatayu’ in 1949. Dara Singh is the only sportsperson to hold his own among Bollywood Superstars all these years and has had a successful movie career not only in Hindi but also in Punjabi movies. He also played the role of Lord Hanuman in the television series Ramayan telecasted on Doordarshan in the mid eighties. However other sportsperson who followed his footsteps like Sunil Gavaskar, Sandeep Patil, Vinod Kambli, Ajay Jadeja etc were hooted out by the general public as they were not able to visualize or digest their favourite sportsman running around trees behind the heroines. These cricketers are worshipped on the cricket pitch however the moment they donned greasepaint public showed them a thumbs down. Similarly we also saw singers like Shailendra Singh, Shaan, Sonu Nigam, Palash Sen and Himesh Reshammiya turning into actors with limited or no success. Himesh Reshammiya after the fluke hit ‘Aap Ka Suroor’ risked his singing and music composing career for acting but all his other subsequent movies like Karzzz, Radio and Kajrare turned out to be box office turkeys. The only exception to the rule was the Late Kishore Kumar who was a successful actor and singer. The same was with models who deserted the ramp shows for movies only to fall flat. It was always believed by the industry people that models are wooden and they cannot act untill Juhi Chawla, Aishwarya Rai, Sushmita Sen, John Abraham and Arjun Rampal proved them wrong with their acting and box office successes. Right now modelling is considered as the first step towards stardom and Priyanka Chopra, Lara Dutta, Dia Mirza, Upen Patel etc are proof to the same. Now the latest entrants to Bollywood are boxer Vijendra Singh and Tennis player Leander Paes who are working in couple of movies. Now lets see if history repeats itself or if these guys can break the jinx which will lead more players to enter Tinseltown. Mindless comedies are the flavour of the season and this Diwali we have not one but two such movies hitting the theatres. After ‘Golmaal 3’ I went to watch ‘Action Replay’ as I have always liked Vipul Shah movies especially ‘Aankhen’,’Waqt’ and ‘Namaste London’. ‘Action Replay’ like Vipul’s first movie ‘Aankhen’ is also adapted from a Gujrati play with the same name and it is nowhere closely identical or remotely inspired by Brad Pitt starrer ‘Curious Case of Benjamin Button’. It is definitely a Sci-fi movie where one of the principal character travels back in time to set his parents love life in place so that their present crisis can be resolved. It does sound like the english movie ‘Back to the Future’ but the similarity just ends there. Bunty [Aditya Roy Kapur] loves his girlfriend Tanya, but runs a mile whenever she mentions marriage. His phobia with matrimony stems from his parents Kishen [Akshay Kumar] and Mala’s [Aishwarya Rai Bachchan] acrimonious marriage. But now Bunty is in a fix. Tanya’s grandfather, Professor Anthony Gonsalves [Randhir Kapoor], has given him an ultimatum — get married to Tanya or stop seeing her. Bunty knows that unless he does something fast, his dreams of living happily ever after with Tanya will bite the dust. As Bunty’s surprise party for his parent’s 35th wedding anniversary deteriorates into yet another explosive fight between Kishen and Mala, he decides to turn back the clock and rewrite Kishen and Mala’s destiny and alter their disastrous marriage into a romantic affair of the hearts. And how does he do that? By using the professor’s time machine to travel back in time. To a time when Kishen and Mala were not married… To a time when Kishen’s father Rai Bahadur [Om Puri] and Mala’s mother Bholi Devi [Kirron Kher] were sworn enemies… To a time when Kishen was a certified nerd, bullied merciless by Kundan [Rannvijay]… To a time when Mala couldn’t stand the sight of Kishen and took great pleasure in ragging him silly. Bunty has to transform his father from a wimp into an eligible bachelor and his mother from a tomboy into the epitome of feminine grace. Then he has to attempt an impossible task — make them fall in love with each other. And finally he has to make his grandparents agree to their love marriage. When a movie with concept like time travel is attempted then it’s imperative that the writing should be so persuasive that the viewer is influenced into believing that people can travel into the past or future. Here if the director had used few scenes to give some more information on time travel then it would have enhanced the impact of the story, but whatever minimal is said about time travel in the film doesn’t register effectively. The time machine looks tacky and tawdry and does very little in convincing you that this piece of scrap can really transport you into a departed era, 1975 in this case. In the acting department Akshay, Aishwarya, Aditya Roy Kapoor and Rannvijay did a very good job. Rajpal Yadav, Om Puri and Kiron Kher are good in their respective roles while Neha Dhupia and Randhir Kapoor are totally wasted. Sudeepa who acts as Aditya’s girlfriend doesnt have much to do apart from looking good a bad role to debut with. Full marks to Nitin Desai for creating the 70’s era come alive in the form of sets. The dress designing department has done a good job alongwith Pritam who has given a very 70’ish music to the movie. Vipul Shah does a good job but compared to his previous directorial ventures Action Replay is a bit of a let down. However on a whole Action Replay is a very good time pass movie for a weekend at the box office you have to wait and watch. After the dull last two weeks at the box office, the diwali week has opened to two big budget movies ‘Golmaal 3’ and ‘Action Replay’. Golmaal 3 like its previous two parts is another mindless comedy and to tell you frankly its a good attempt and raises the bar for Golmaal 4. Golmaal 3 although looks inspired by Ashok Kumar, Pearl Padamsee starer ‘Khatta Meetha’ and ‘Hamare Tumhare’ which in turn were inspired by the English Classic ‘Yours, Mine and Ours’. The writers have done a very good job by taking few elements from the above mentioned movies and then blending with the Rohit Shetty type of humor. Golmaal 3 highlights the story of hatred between two bunch of siblings. Ajay Devgn [Gopal] lives with his brother Shreyas Talpade [Laxman], mother Ratna Pathak Shah [Geeta aka Guddi] and best friend Kareena Kapoor [Daboo]. Their world collides with another trio, Arshad Warsi [Madhav], Tusshar Kapoor [Lucky] and Kunal Khemu [Laxman]. Arshad, Tusshar and Kunal’s father Mithun Chakraborty [Pritam] and Ajay and Shreyas’ mother Ratna Pathak Shah decide to rekindle their relationship and with Kareena’s persuasion even get married. But there’s a problem: The kids detest each other. To complicate matters further, there’s a thief Johnny Lever [Puppy] and his henchmen [Vrajesh Hirjee and Sanjay Mishra] and a necklace that’s hidden somewhere. One thing I would like to add here. Any movie with eight main characters would have led to a huge confusion and chaos however after watching the movie i felt that each character was well etched out and by the time the movie concludes, you don’t feel that the show belongs to any particular actor. The movie belongs to everyone! There are many scenes involving Johnny Lever that raises huge laughters. Johnny Lever has delievered a fantastic job and is a pleasure to watch him act as a scatterbrained and absentminded theif. Ajay Devgn does a good job while Kareena definitely walks and talks like a tom boy. Rest of the cast that includes Arshad, Shreyas, Tushar, Kunal Khemu, Mithunda and Ratna Shah are very good, especially Tushaar who does an entire emotional outburst in his typical dumb way and he has definitely delivered another award worthy role. The only thing that stands out as a sore point is the climax which has become very typical with Rohit Shetty movies where he uses the entire starcast like Priyadarshan. Even the music by Pritam is a big let down not even one song is worth humming apart from the signature ‘Golmaal’ song. All in all this movie is a must watch for people who love Rohit Shetty’s brand of movies and doesn’t like to question the story. At the box office this movie will definitely do good business like the previous Golmaal outings.